Vista Alegre, a ruin of a town near the northern tip of the Yucatan Peninsula in Mexico, was once a bustling outpost. Dozens of canoes crowded the harbor, loaded down with dyes from the west, jade from the south, and obsidian from mountains hundreds of kilometers away. The sound of trumpeting conch shells periodically sliced the air—an alert from sentries scanning the horizon from platforms attached to stone structures. The call signaled an incoming boat—to trade or, perhaps, to plunder. Within the town, the smell of fish hung heavy in the air as fishermen hurried about with their catches slung across their backs. They passed a man outside his hut hacking a pile of decorative shells into portable sizes for the next outgoing canoe. In another hut, a woman was using salt from a town to the south to dry freshly caught fish that would then be shipped to cities far away. And all the while, smoke from a signal fire atop a pyramid guided exhausted ocean travelers to safe harbor. Today, a thousand years later, the town isn’t much to look at. Centuries of accumulated dirt and vegetation cover the pyramids. Trees growing on various structures have succumbed to gravity, tumbling and taking with them massive stone blocks once perfectly fitted together. Though part of the ancient Maya world, which stretched from here all the way into modern-day El Salvador, Vista Alegre lacks the grandeur of many sites. It doesn’t have the dozens of glistening pyramids that lure millions of tourists to Chichén-Itzá, the enticing carvings of Palenque, or the vibrant murals of Bonampak. In fact, were it not for a single pyramid in the middle of a handful of crumbling structures, you might miss its human past altogether. But this small port town at the bottom of the Gulf of Mexico was once part of a complex network of coastal commerce that dominated the ancient world but has been understudied by academics and ignored by the public. Because, unlike Chichén-Itzá or Palenque or Bonampak in the interior of the country, time has nearly erased coastal ports like Vista Alegre from history. 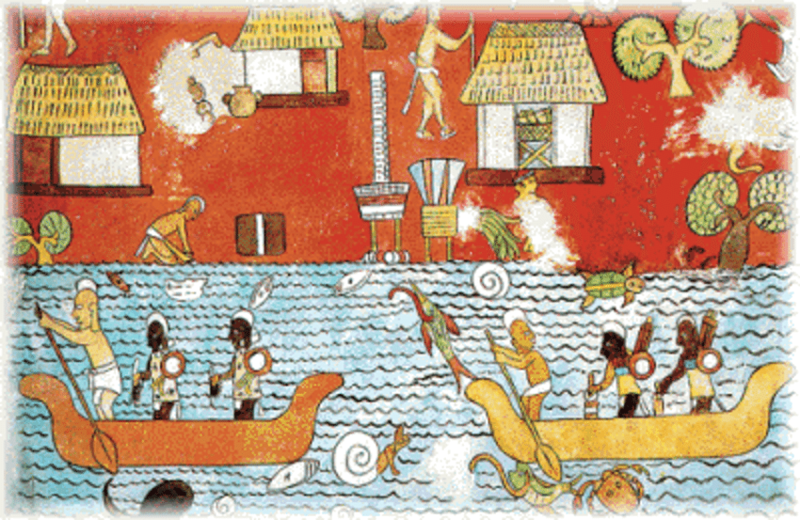 It’s part of a growing collection of archaeological sites revealing a complex and cosmopolitan network of sea traders with their own culture and traditions, who are at once separated from and deeply tied to their more famous compatriots deep in the Yucatan jungles.